Nha Trang is a lively seaside town 7 to 10 hours away from Sai Gon by train, depending upon which train service you use. This is popular destination in the summer months, particularly February through to April when there is the least rainfall, and if you want to travel in one of the 1st Class or VIP Sleeper compartments then we recommend that you book well in advance. If you plan to travel in the rainy season, from middle of September to middle of December, then you are less likely to need to book a ticket in advance as few holiday makers visit Nha Trang at this time of year. There are 11 direct train services a day from Sai Gon (also known as Ho Chi Minh City) to Nha Trang. The fastest train is Train #SE4 departing from Sai Gon at 22.00 and scheduled to arrive 7 hours later at 05:00 the next day. The slowest train is Train #SNT6 which is scheduled to complete the journey in 9 hours 25 minutes. 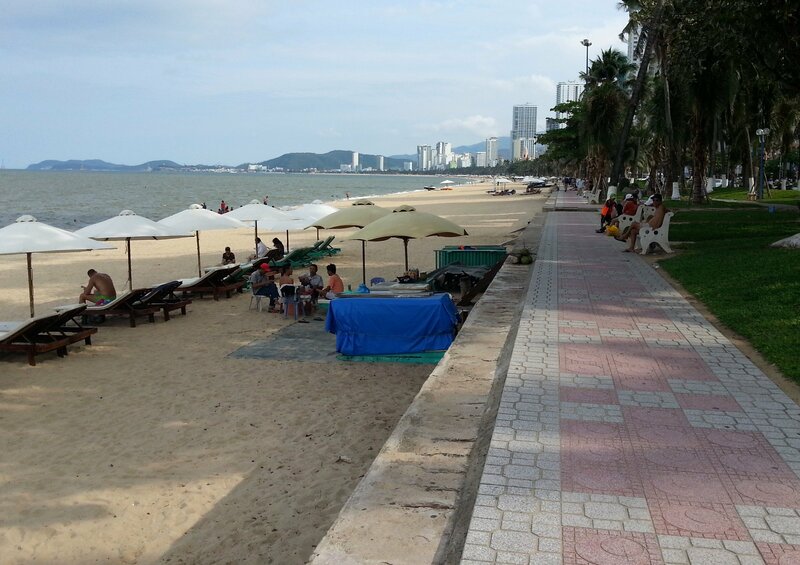 Nha Trang is Vietnam’s most popular beach resort town which can become very busy in the summer months with Vietnamese people coming to the city in large numbers on vacation. The city beach itself is not that great in comparison to other lesser areas in South East Asia, however, there are other beaches and diving spots nearby that are definitely worth visiting. National Oceanographic Museum of Vietnam: An aquarium open to the public featuring an interesting range of sea life including from sharks to sea horses and pretty much everything in between. Po Nagar Cham Towers: A Buddhist religious site featuring 4 brick towers constructed around 1,000 years ago. Thanh Dien Khanh Fortress: European style fortress built in 1793. Ba Ho waterfalls: A series of waterfalls located around 20 km North of Nha Trang City. Live Music: In the evenings a number of bars in the City have live music by foreign performers. The most popular, but not necessarily the best, venues are the Guava Bar and the Red Apple Club. Monkey Island: As the name suggest, an island with lots of monkeys, which is a ferry ride away from Nha Trang City.